It's time to start on the Christmas cards unless you're like me and like to work under pressure the last week of November! 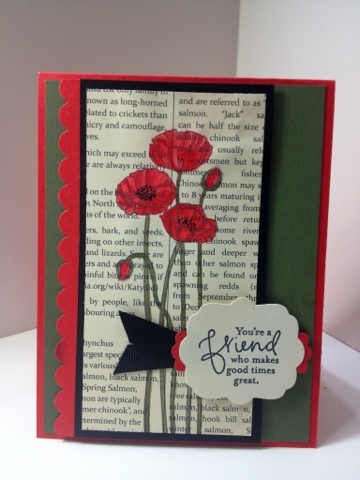 Here is the first card with layered fishtail flags and the sentiment in the bottom corner. Watch for more cards coming soon! Finally a rainy day in Florida which means a great day to be in my studio to create. I haves colored with my Copics since the fall and I was so disappointed to see how much I lost not using them but practice gets you back in the groove and there was plenty to color on this adorable stamp. I used my fishtail flags die and hand cut a mat. I also blocked the image and left the flowers to stand off the edge. Isn't she so cute? Posted by Karen at 5:36 PM 0 Click here to leave me a comment. It's been a busy start to the year and January has just flown by. I have been doing some heavy cleaning and organizing and had a few minutes to make a card since all the stamps are organized and ink pads are at my finger tips! 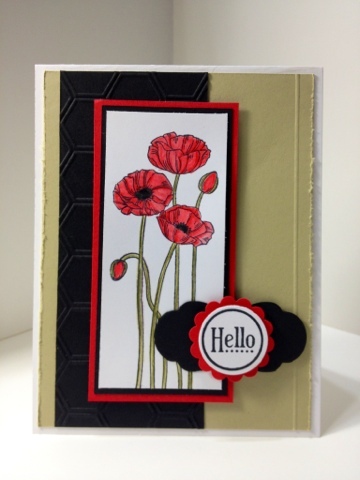 Today's card is made with the stamp Pleasant Poppies. It's one of my favorite go to stamps when I need a long image. This is just part of the stamp which makes it very versatile. I colored the image using my new Inktense Pencils. They give a very vibrate color which makes these flowers pop! Posted by Karen at 10:19 PM 1 Click here to leave me a comment. I can't believe we are almost through January! It will be Valentine's Day before you know it. Have you started your valentines projects? 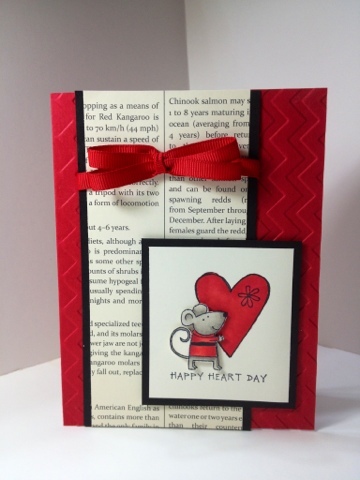 I was working on e Valentine sampler class and came across an oldie but goodie stamp set and stopped and put this cute little card together. I used the first edition paper along with real red cardstock. The mouse was stamped, colored and cut out so I could make him 3D with my dimensionals. Isn't be the cutest? Posted by Karen at 10:45 PM 1 Click here to leave me a comment. I just love the look of colors that's "pop" and that is exactly what you get when using the Dewert Inktense pencils. They work like a water color pencil but once they are dry they are permanent. 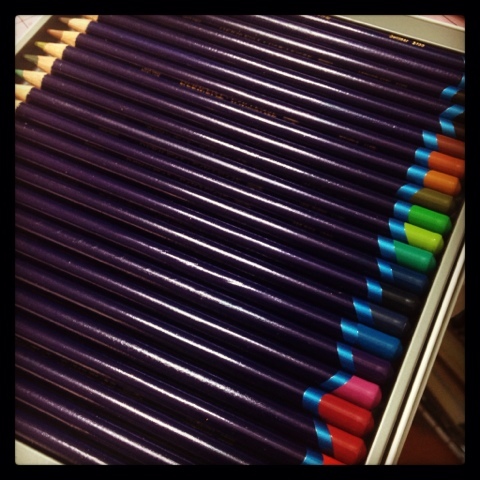 The poppies on today's card was colored using these pencils and I love the bright color! I stamped my image on the first edition designer paper using my Momento black ink. I then used my water brush and layered color taking it from the pencils until I achieved the results I wanted. I'm working on another project using these so stay tuned! Posted by Karen at 6:34 AM 0 Click here to leave me a comment. Another weekend has almost flown by. Katie and I have accomplished a lot today! We put all of the Christmas stuff in the attic, made dog biscuits for Sadie chocolate chip cookies and did all of the laundry. 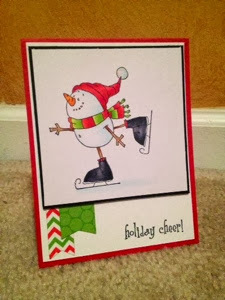 I managed to knock out a cute little card using some of the new Stampin Up products. 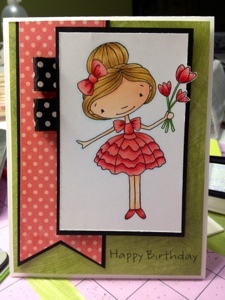 The Cloudy Day embossing folder is a must have! It embossed the cutest little clouds. 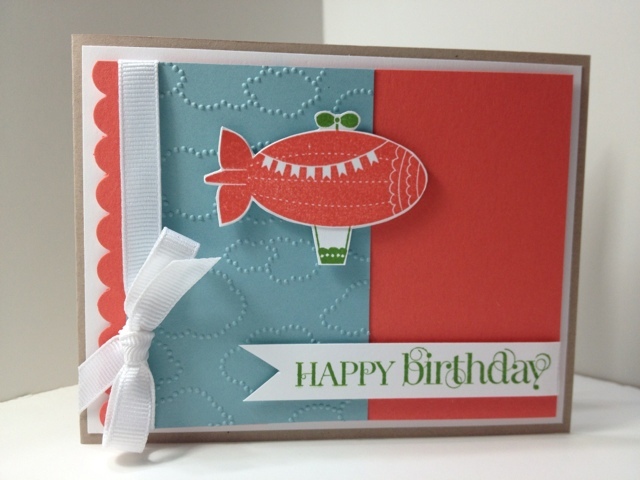 I have used it here on the Bahama Breeze cardstock and how perfect it accents the hot air balloon! This is from the Moving Forward Charity set. I layered my cardstock with dimensionals and added the Happy Birthday on a flag tail strip. Posted by Karen at 4:58 PM 0 Click here to leave me a comment. Another year has come and gone! I'm starting to plan for new classes and projects to share with you! 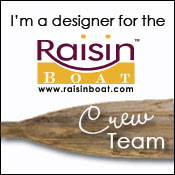 One of my upcoming ventures is to share my passion for creating with you through online classes! I will keep you posted when this goes live! I want to put out a huge Thank You to my subscribers and followers! Your kind words inspire me to create and share new things with you. Today's project is a thank you card made with the cutest little bee! I used my dauber and inked around the edges and raised sections of the honey comb for some added character. To finish I tied a double bow (some of you will learn how easy this is)! Posted by Karen at 9:39 PM 1 Click here to leave me a comment.